There are, however, a few players Chicago can cut to clear some space. I put the logical options in a table below, along with how much cap room cutting them would create. Dion Sims is gone. That’s $6M for sure. The rest of the cuts are not quite as simple. 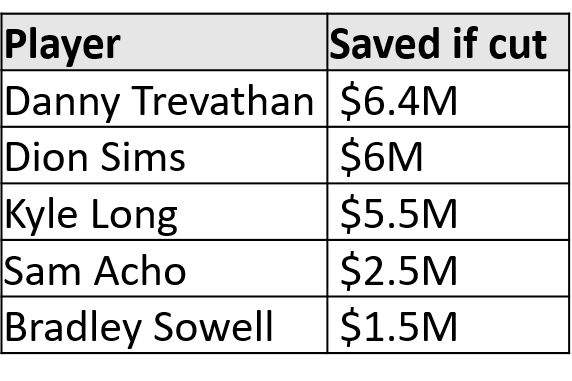 I almost didn’t include Trevathan on this list, as I’d be shocked if he’s cut, but he’s one of the few players who the Bears could actually cut to save significant money. Most of their big contracts are structured to be through at least 2019 before it makes financial sense to move on from them. So they could move on from Trevathan if they’re desperate for cash, but that would create a huge hole in the middle of their defense without really having resources to fill it adequately. Something is going to happen with Kyle Long. He’s making too much money for a guard who has missed at least 6 games each of the last 3 years. The Bears could decide to cut him and go with Bryan Witzmann – who filled in capably for the 8 games Long missed this year – for much cheaper. I personally think it is more likely Long takes a significant pay cut but stays with the Bears. He seems to love it here, and has to know he won’t get much money on the open market given his age and injury history. Based solely on production, Sam Acho seems like an easy cut to me. He has done nothing to justify that high of a salary. But he’s an important piece off the field, and the franchise seems to love him. He’s another guy I think could be back for a much smaller cap hit (closer to the veteran minimum he deserves). I doubt they cut Bradley Sowell, as he’s not a completely terrible tackle and doesn’t have a huge cap hit. However, if they can’t afford to re-sign Massie and want to bring in a better free agent than Sowell to compete with Rashaad Coward, Sowell could be cut to clear a little room. Let’s assume they cut only Sims and Acho from this list, two guys who didn’t really contribute this year. That leaves them with about $21.5 million to work with. Teams can also create short-term cap space by restructuring contracts. This usually works by converting that season’s salary to a bonus, which doesn’t change anything for the player in terms of money they receive but lets the team spread that salary over several seasons’ worth of cap. It creates more space in 2019, but increases the players’ cap hit in future years. This only really works when a player is on a massive, long-term deal, and thus Khalil Mack is really the only Bear worth considering here. He has an $11.3 million salary for 2019, so the Bears could spread that out evenly as a $2.3 million cap hit each year from 2019 and 2023 to save up to $9 million on the 2019 cap. There is no free lunch – that would remove $2.3 million in cap space each year from 2020 through 2023 – but if they want to maximize their current window, that could be an option. So the Bears could get up to around $30 million in cap space without cutting any key contributors from the roster, but it would hurt their cap for 2020 and beyond a bit. Now with that cap space, the Bears need to figure out how to retain or replace the 20 players scheduled to be free agents. 14 of them will be unrestricted, meaning that Chicago no longer has any rights over them whatsoever. The key contributors are listed in the table below. Callahan, Massie, and Amos are all starters, and the Bears are likely only going to be able to afford 1 of them, maybe 2 if they really get creative. I’ll have more coming up about the types of contracts those players will likely receive in free agency. Witzmann is notable because he started 7 games in place of Long, and actually played pretty well. I wouldn’t be shocked if they sign him to something like Eric Kush’s last contract (2 years, $2.7M) and cut Long to save money. Lynch was also a key contributor for the Bears this year, and I’m not sure they’ll be able to afford to bring him back. His 2018 cap hit was $4M, and the Bears won’t be able to afford that. He’ll have to choose between staying in Chicago or maximizing his earning potential. Josh Bellamy was a solid WR4 for the Bears this year and is a core special teamer. I’m guessing they will prioritize bringing him back, likely for a deal that is something like that of Sherrick McManis, who is basically his defensive clone on this roster. McManis is currently on a 2-year deal worth $1.75M a year. I don’t know if the Bears bring Pat O’Donnel back or not, but if they do it will likely be on a prove it deal like in 2018, when he had a cap hit of $1.5M and had to earn his roster spot in training camp. That’s not a lot of money, but every little bit adds up when you’re tight against the cap. The Bears could probably save about $1M and get close to the same production by signing 2 undrafted punters and letting them duke it out in camp. One way or another, they need a punter for next year. Give him a 2nd round tender. This would force teams to give the Bears a 2nd round pick if they sign RRH, which wouldn’t happen. It keeps him a Bear for one more year with a cap hit of around $3 million. Give him an original round tender. This lets any team negotiate a deal with RRH, but gives the Bears the right to match any contract he signs. It gives Chicago less control, but saves them about $1M in cap space. You might recall the Bears faced a similar situation with Bryce Callahan and gave him an original round tender, which he ended up playing the 2018 season on. It’s a risky move that leaves them vulnerable to somebody else signing him away, while the 2nd round tender guarantees he’ll be in Chicago for one more year but costs them a bit more cap space. Given their cap situation, I think the Bears go for the original tender to try and save a little money. And given RRH’s limited snaps and production, it’s a decent bet that nobody is going to sign him to a long-term deal. But with Chicago’s tight cap situation and the high visibility of their defense this year, he might get snatched out from beneath them by somebody hoping to hurt them a little bit and get a useful contributor. This is an under-the-radar situation worth monitoring this offseason. Update: Over the Cap lists RRH as an exclusive rights free agent, which would mean he can be kept on a one-year tender for a minimum salary. This would both protect him from being poached and save the Bears about $1.5 million against the cap. That would be fantastic if true. Finally, a quick word about kicker Cody Parkey, who was bad for the Bears this year after signing a big contract and has a $4 million cap hit for next year. Easy cut, right? Except if they cut him, his dead money will actually cost them about $1 million more than if they have him on the roster. But I think the Bears have to do it. Then they’re looking for a reliable kicker yet again, but they don’t really have a choice. That’s going to eat into what little money they actually do have. Here’s a quick TL;DR recap for those of who you don’t like wading through 1500 words of detail. The Bears have around $13 million in cap space, but can clear about $8.5M more by cutting two guys who don’t contribute much on the field (Dion Sims and Sam Acho). They can also cut Kyle Long ($5.5 million) and/or restructure Khalil Mack ($9 million) to clear more space, but that creates a hole at right guard or hurts the future cap, respectively. 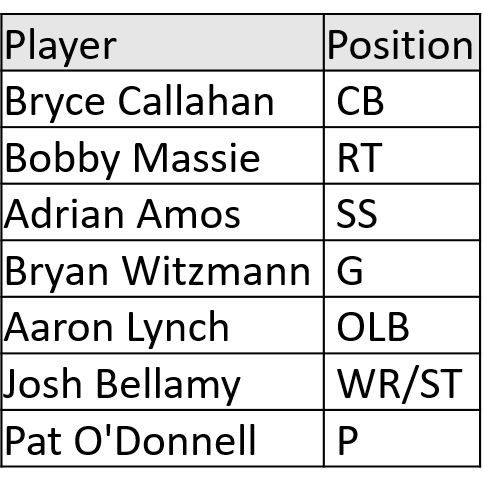 Three starters – Bryce Callahan, Bobby Massie, and Adrian Amos – are free agents, and the Bears don’t have the money to sign all of them. Several other key contributors (mainly Bryan Witzmann, Aaron Lynch, Josh Bellamy, and Roy Robertson-Harris) are free agents as well, and the Bears need to find a way to keep or replace each of them. The main takeaway is this: after years of drastic changes every offseason, this is going to be a quiet one for the Bears. They don’t have much money to spend, and most of it will probably be spent trying to keep their own guys from leaving. Their first draft pick won’t be until late in round 3. Like I said last offeason, Ryan Pace has built a roster that isn’t changing much the next few years. This offseason particularly, they’re likely to focus on keeping as many of their own guys as possible, tweak a few things around the edges, and look for improvement to come from within.